Kershaw Emerson Knife 6030 CQC-10K. 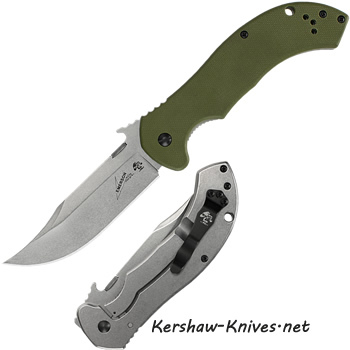 This knife has been designed by Emerson and built by Kershaw as a hunting survival knife. It has a Bowie-style blade ideal for hunting and has been built for the toughness, durability, and edge-holding capabilities your next hunting trip demands. The blade is 3.5 inches long and 1 inch wide, covered with a stone wash finish on front and back. 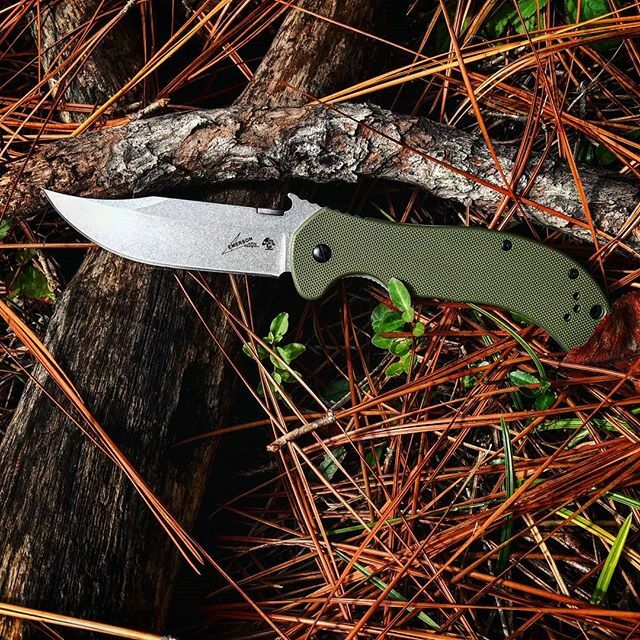 The handle has the hunter green G-10 scales on front to help secure your grip while the back side is silver with a 410 bead- blasted finish so it is smooth in your palm. Handle is 4.75 inches long. Black pocket clip can be changed from left to right in a tip up position. Lanyard hold on handle. Frame lock system. Opens manual style and also with the wave shaped opening feature- the thumb disk- which allows the blade to deploy when this disk runs over your pants pocket.